The fish box in 2015. Author’s photo. 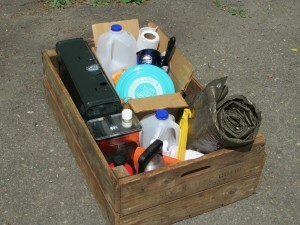 I keep my camping gear in an old wooden box that sits neatly in the back of my car. Nothing unusual about that. But when I packed up to go Canso for the Stan Rogers Folk Festival this summer, I realized this would be a kind of homecoming — for the box. Let me explain. The box is about thirty-two inches long, twenty inches wide and maybe ten inches deep. Just a few boards nailed together, and an opening for your hands at each end so you can get a good grip. It’s what they call a fish box, standard equipment on fishing boats a generation or two ago. You needed them to load and carry fish. I’ve had that box ever since I was a student in Halifax in the 1970s. There were at least a dozen of them in the old garage behind the house where I lived, and the reason they were there is the story that takes us all the way back to Canso. In the spring of 1970, the fishermen who worked on the small trawlers out of Canso were on strike. They were earning about $3,000 to $5,000 a year, poverty wages and long hours that worked out to be a dollar an hour or less. They wanted a union contract to give them a better wage and some measure of safety, security and respect on the boats. They picketed the local fish plant and shut it down. They sent out press releases and went to public meetings. They called on other unions for support. They came out to the Trans Canada Highway and demonstrated on the Canso Causeway. And they called for changes in the law that said fishermen were not “employees” but “co-adventurers”. Because of that law, they were not even entitled to have a vote for certification of a union, the very thing the coal miners and steelworkers had fought for in the long labour wars earlier in the century. A citizens’ committee later sponsored a vote anyway, which proved that the fishermen were almost unanimously behind their chosen union. The fishermen needed to get their message out, and that’s where the fish boxes come in. In the summer of 1970 they went out in their own boats and hauled in catches of mackerel, haddock and cod. Then they drove to places like Sydney and Halifax to sell the fish. 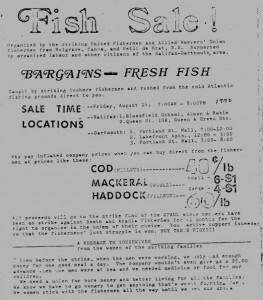 Prices were 40 cents a pound for cod fillets and 60 cents for haddock, four large mackerel for a dollar. These were bargains for fresh fish, and all the money went to the fishermen. But the sales ran into trouble with city authorities in Halifax. For one, the fishermen had no vendor permits. And the boxes were made of rough wood, not the stainless steel bins mandated by local standards, another example that what was good enough for Canso was not acceptable in Halifax. Nor was the union in question acceptable. It was the United Fishermen and Allied Workers Union, for many years the union of choice for fishermen in British Columbia. The Canso fishermen believed they could make a difference on the east coast too. But when the UFAWU was mentioned, employers and governments and newspapers, and even some unions, saw red. They claimed the union was Communist-dominated and wanted it out of the province. In the end, the fishermen’s strike broke the back of indifference to the poverty and exploitation of fishing families in Nova Scotia. The government changed, and next spring the labour laws were amended to bring fishermen under the Trade Union Act. It was a pyrrhic victory for the UFAWU. Through cynical manipulation of the labour relations system, the west coast union was frozen out. Their supporters were dismissed or blacklisted or forced to abandon their union. The fishermen had won many battles, but they did not get the union of their choice. This is the barest outline of one of the classic stories in Nova Scotia labour history. 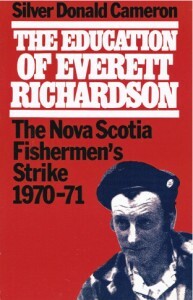 You can read many details in the excellent popular history by Silver Donald Cameron, The Education of Everett Richardson: The Nova Scotia Fishermen’s Strike, 1970-71. Cameron treats Richardson as a kind of “Everyman” whose life was changed by the experience. When he received a nine-month jail sentence for defying an injunction against picketing, Richardson became a symbol of resistance. I brought my old copy of Cameron’s book along with me to the Stan Rogers Folk Festival. Once again I admired Cameron’s insights into the culture of that time and place. He showed how the fishermen were trapped between the old rural economy and the new industrial one and how they used their “country cunning” to challenge their status as one of the modern underclasses in Canadian society. As I sat there at the Festival and turned the worn pages, I also noticed that many of the names in the book were similar to those of the organizers and volunteers behind the scenes who were listed in the program. One of Cameron’s themes is the way small communities are able to marshal resources of spirit and determination in the face of big odds. When it started in 1997, the Stan Rogers Folk Festival itself was a response to the collapse of the cod fishery and the closing of the fish plant. As Cameron pointed out when he read excerpts from the book at the Festival a dozen years ago, the people who organized it were the next generation of community activists, doing what they could to build a new local economy. Stan Rogers’s “Rise Again” theme was very appropriate this summer too, as people turned out in large numbers to help the Festival recover from the cancellation last year, when Canso was under siege by Hurricane Arthur. In this year’s good weather, it was clear that the winds of the North Atlantic can also be harnessed, as the wide-open sky above Canso now features a stand of wind turbines — a major community-led power generating initiative. As I packed up my camping gear in that wooden box, I reflected on the rich program of the Festival. Veteran performers such as Steeleye Span and Rita Coolidge and Guy Davis. New finds from Texas and Australia and Scotland. But the heart of the festival remains in the core of dedicated songwriters from the Maritimes, people such as Bruce Guthro and Dave Gunning and Thom Swift, who for all their successes have not forgotten their roots and always deliver on that theme of resilience. No wonder that one the biggest audience responses was for Lennie Gallant’s performance of Peter’s Dream, a song that is both a lament for the decline of the fishing industry and also a celebration of community persistence. Gallant was writing about Prince Edward Island, but it might as well have been Canso. As the fish boxes reminded me, Canso itself has a story entirely worthy of the Festival. David Frank is a former professor of history at the University of New Brunswick. He has attended folk festivals, intermittently, for almost fifty years. Nice evocation of event and theme using adaptive re-use of significant material culture. Don’t lose the box.